Home→Uncategorized→What do kids use Moodle for? ← So You Want To Moodle? What do kids use Moodle for? 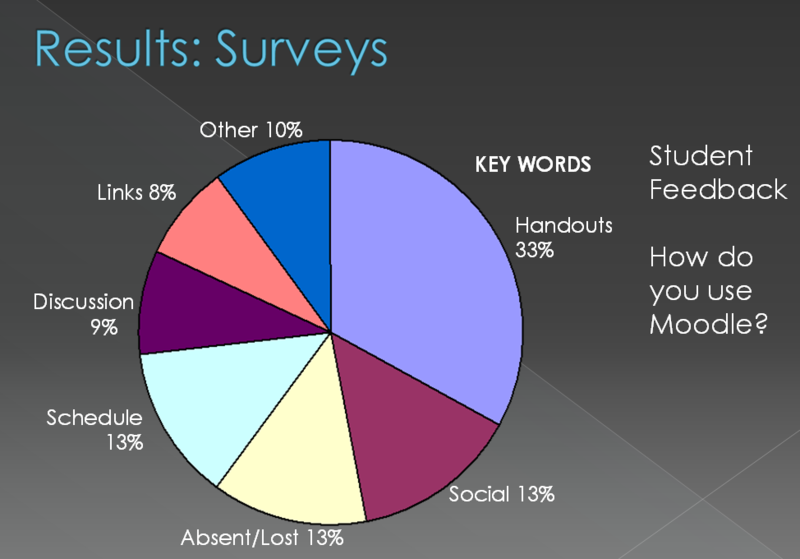 I surveyed students after our first full year of Moodle use to see what they thought about Moodle. I distilled student comments and found certain words and themes that came up often. I called these keywords. Check out the graph below for a snapshot of the results. Obviously a lot of what they use Moodle for has to do with what their teachers set up: primarily to access handouts and schedules. However, middle school students also used the Moodle messaging and tag feature to create an online community. It was spontaneous. This reveals how much untapped potential there is in creating online learning spaces for students. If educators can embrace social media and help craft positive online spaces for kids, we might see online behavior improve. Also we can harness their desire to interact online and try to push them into creating and learning educational content. I use it for printouts of schedules, PowerPoint lectures, class notes. It helps a lot with absences. One night before a history test, I went on my school and found a power point that helped me study for the test. I have also logged on and gotten the homework for language arts so I knew what was coming up the next week. It really prepared me for the next week. I used it to transfer information to my partner through instant chat. How do students use Moodle. We are going to try adding the OU blog plugin so that students can create and COMMENT on blogs. Also we hope to add the shoutbox plugin so we can create a twitter-like community on our Moodle as well. It will be interesting to see if students will stay active on Moodle socially as they age and start becoming more active on “real” social networks. In general, our high school students weren’t hanging out on our Moodle. I wonder if tools like Ning or Elgg would be a better fit for high school students. Thank you for reading. I just read the Moodle.org news about all of your work for Moodle. Currently nothing is being logged in the tag page editing. I think using a wiki type page for the tag page would be good. Thank you for sharing you Moodle experiences. If you can remember exactly what things on the tag pages were not being logged please file a bug report at http://tracker.moodle.org/, so we can fix it. (Preferably search first to make sure there is not already a report. If there is, please add any additional information to that. Thanks, Tim.